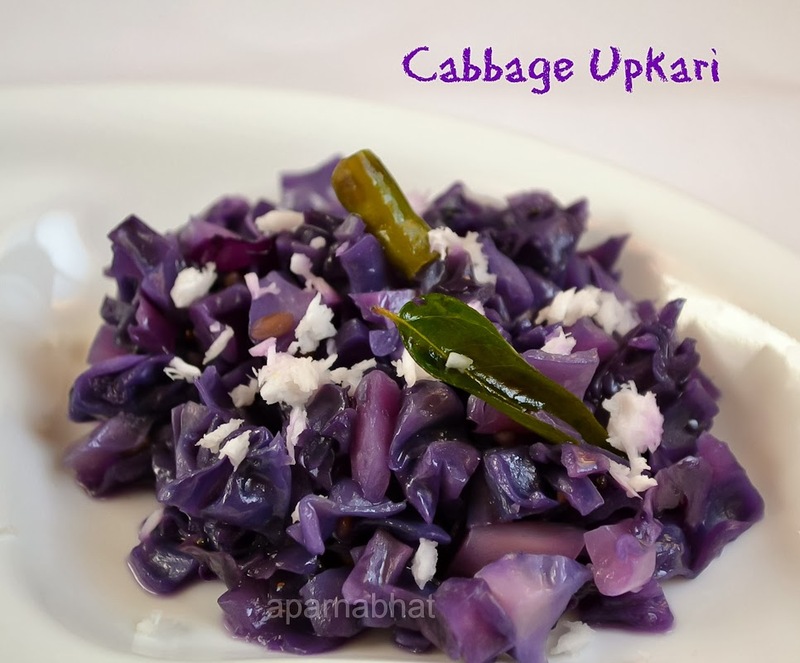 Cabbage upkari /stir fry is a simple amchi upkari [Konkani cuisine] served as a sidedish. Even today I ponder over the episode of burnt cabbage upkari that I had prepared when I was in 7th/8th std. I had never ever ventured into the kitchen to lend a helping hand or show my interest in cooking before this episode. 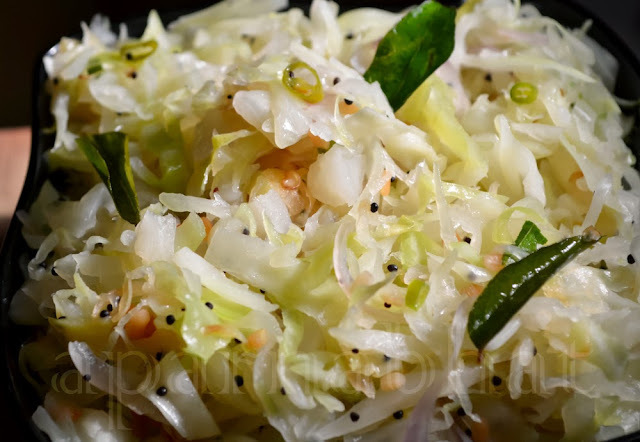 Seeing my enthusiasm to cook, the first ever recipe my amma suggested was "Cabbage upkari" the easiest of all :P. She told me the method and I requested her to handover the kitchen to me. I followed the steps exactly as she instructed me to do, but I forgot to stir the vegetable at intervals and the veggie got burnt completely. Since that day, I had held this recipe responsible for making me lose my enthusiasm for cooking [whatever interest had tweaked in that time] but post marriage, this stir fry preparation only gave me back my confidence in cooking :). 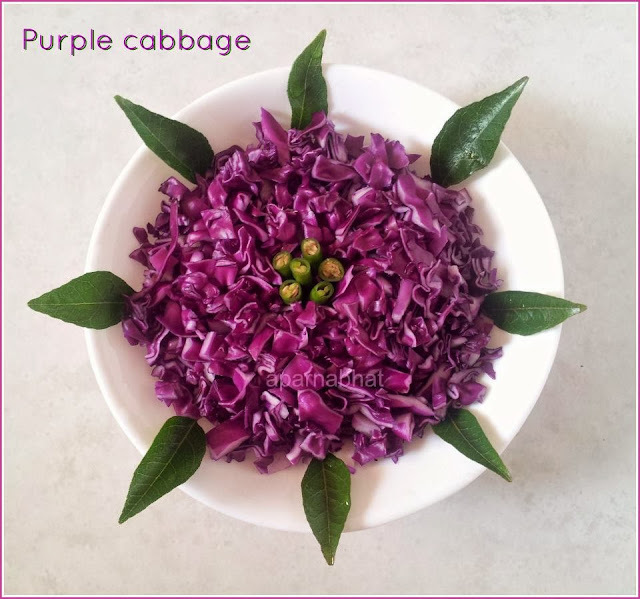 Below is the pic of shredded purple cabbage. Heat oil in a pan. Add mustard seeds, when they splutter add urad dal. Stir them till urad dal changes its color to light brown. Add chopped green chillies, curry leaves. Add shredded cabbage. Stir fry for 2 mins. Close it tightly with a lid and allow to cook on medium flame stirring at intervals. Add salt, sugar and sprinkle water if required. When cabbage is completely cooked add the grated coconut. stir well and switch off the flame. Stir fry is ready and you can serve it with chappatis or rice and dal. The above pic shows stir fry prepared from regular cabbage. I have added finely sliced onions to this stir fry and omitted fresh grated coconut as a variation to the above recipe.